Swamp Wallaby and the Big Wave: Meet Didj! Hanging from a Jet ski while being towed by a helicopter…this is as exciting as it gets! Cousin Didj is an easy-going didgeridoo player. The rhythmic sound relaxes Didj from the cares of this world. Didj is the most cautious of the Wallabies, but cousin Swamp can talk him into just about anything! Swamp Wallaby and the Big Wave: Meet Gizmo! The Swamp Wallaby family’s best mate is a Red Belly Black Snake…? Gizmo is a Red Belly Black snake, he can twist and turn into any shape. He is ready to help out the Wallaby family in anyway he can. Can a snake really become a spare wheel for a kombi van? 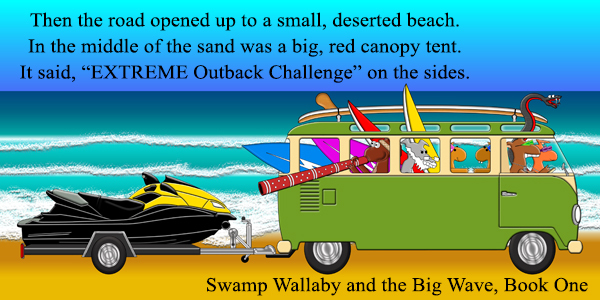 Swamp Wallaby and the Big Wave: Meet Jilby & Bilby! Bilby and Jilby are Swamp’s twin younger brother and Sister! Bilby and Jilby are Swamp’s twin younger brother and sister. They are full of energy, although they lack the cool skills of their older bro. The mischievous, fun-loving duo often find themselves in risky situations as trouble seems to follow them everywhere.